How did they give us the first place in the Hackathon Blockchain Summit Latam 2018? On November 23 and 24, 2018, the fourth edition of the Blockchain Summit Latam (BSL) was held in the city of Santiago, Chile. 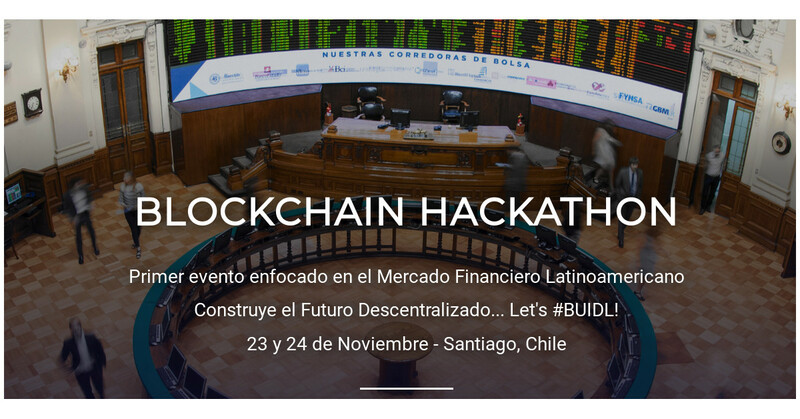 The event was sponsored by the Santiago Stock Exchange, the Central Depository of Securities (DCV) and Godzillion with the intention of promoting the design of solutions with "Blockchain" technology for the approach of different problems and challenges in the financial markets of Latin America. Winner Challenge Stock Exchange of Santiago (BCS) - "HackNow"
Winner Challenge Central Depository of Securities - "La Bolzita"
Winner Challenge Godzillion - "LuCha"
Winner Blockchain Hackathon 2018 - "La Bolzita"
Finally, a winning team of the 4th edition of the BSL "La Bolzita" was recognized. The team was integrated by Rosa María Orellana, Dennis Vivas Zelada and Pooran Prasad Rajanna. 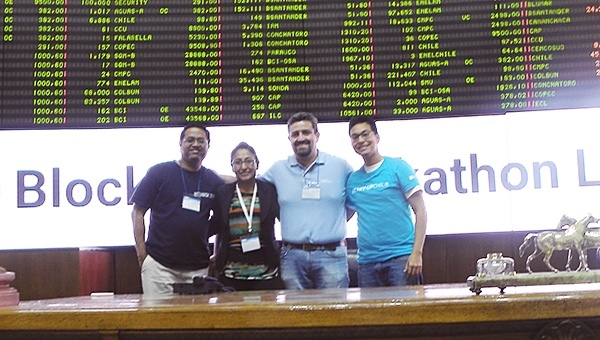 All of them met during the Seed 20 program of Start-Up Chile in the Sofi.la projects, as well as WhatElse. 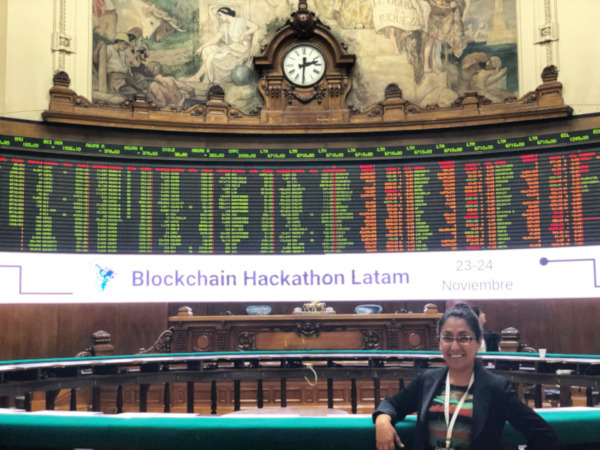 To know the details of the hackathon, we spoke exclusively with Rosa María Orellana, co-founder & CEO of FintechLab and Start-Up Sofi.la, recently accelerated by Start-Up Chile. Rosa María, what is Blockchain? and why are companies so interested in exploring and attracting talent for the use of this innovation in the financial industry? Blockchain technology is a distributed database with asymmetric cryptography that provides security in the use of a special type of data in a shared way between a business network decreasing transaction costs in a shared value chain information in their processes, providing traceability, immutability and transparency to the data, and opening the possibility of transferring "digital assets" through the internet using the "token" as accesses to use this technology. We use Microsoft Azure to consume the cloud service of the Blockchain Ethereum as a microservice within the solution proposed in the Hackathon. His great interest comes from the new function that gives a "data" to be treated through this new Internet protocol. and, to enter into context in the financial markets, what is the Central Depository of Securities or DCV? The DCV is the Central Depository of Securities, a key entity for the operation of the national financial market in Chile. It is the sole securities custodian of Chile, without it all the buying and selling negotiations that take place on the stock exchanges or in the out-of-stock markets could not occur. Tell us a little more, what was the challenge proposed by the Central Securities Depository? The challenge was to use the Blockchain technology to avoid the physical transfer of shares from different technological platforms, through an electronic document with advanced electronic signature connected to a network. In addition, it should allow payment of purchases and sales through an entity that is guarantor, and finally, should allow the register of shareholders to be updated through that platform. So, what was the solution you proposed? After having a closer understanding of the problem through interviews and an extensive conversation with the heads of department and deputy managers of the Central Depository of Securities, where we use different innovation methodologies so that our interaction with the team is as agile as possible, we we propose "La Bolzita", a new way to negotiate shares outside the stock market, update the register of shareholders and authorize the payment of the digital transfer of shares in a secure manner. On the other hand, in your experience, how to propose solutions using blockchain technology? In the first place, the problem to be solved must be understood in depth. This will allow us to identify what part of the architecture of the system needs to have a digital asset component, define the characteristics of processing speed of transactions, level of privacy of the network, consensus algorithms, among other variables to select the type of blockchain more suitable for the proposed solution. After that, within the team, we select the stack of engineers needed to propose the solution. Normally, we work with data engineers, software engineers and specialists in user experience and financial business processes that allow us to make execution viable. and finally, how could the use of this technology be transformed into a competitive advantage for DCV for the next 10 years? The use of Blockchain technology in the financial markets has been taking more dynamism in the last year. Cases such as the Singapore Stock Exchange, Nasdaq and the Santiago Stock Exchange have been implementing it successfully with business cases that have allowed them to generate cost savings, as well as opening new business lines to their customers. Recently, work has been done to redefine "good corporate governance" for this new collaborative business model. The internet changed and went from an "internet of information" to a "internet of value". In this way, the DCV, being a "node" of the Blockchain network, could be the entity that articulates a business network involving the Santiago Stock Exchange, commercial banks, and buyers and sellers of debt and equity instruments; allowing access to new clients by redesigning the service experience, making the technology transfer to the MILA to reduce transaction costs to customers of different nationalities and provide access to new players to the market through new ways of guarding the value of tomorrow. If you want to know more about our products like Sofi.la, a new way to sell on credit, or know more about us, write to info@fintechlab.pe.